Home agriculture Food additives – are they the problem! Food additives – are they the problem! Before the industrialisation of food, very little of what we consumed had any preservatives. Now, food is big business, with a strong focus on massive output. Britain was the first country to see agriculture become an industry. Its land workers left the soil as machines took over. This was a necessary intervention to save a population from starvation. Downside? Nobody knew when enough was enough! Mass use of agrochemicals alongside hybrid plant breeding, intensive livestock rearing. . prophylactic use of pharmaceuticals to increase weight gain in animals. You name it – we seemed to have started it! As well as this, we added in some pretty spectacular E additives. 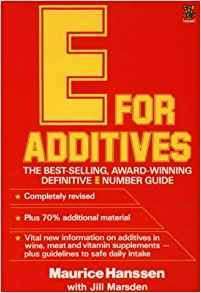 An excellent book on this subject – E for Additives! Here’s one of my ‘favourites’ – it horrifies me that people might be unknowingly eating human hair when they buy their daily bread! Hands up to not having read the revised version of E for Additives. I hope things have changed. Suspect they haven’t. Have a web Additives search yourself…..
A compound produced from L-cysteine (E910) a naturally occuring sulphur containing amino acid that the body needs to produce Glutathione, one of the body’s major antioxidants. Commercially produced from hair and feathers. Found in flour and bakery products (except wholemeal) where it is used as an improving agent and in chicken stock cubes where it is used as a flavour. Diabetics should be aware that there are some reports that it may interfere with insulin and there are anecdotal reports that it can react with monosodium glutamate (E621) in individuals who suffer from the so called Chinese restaurant syndrome, a set of symptoms, including headache, burning sensations, dizziness and disorientation. Chewing gum – can it be good for you?